Read about how this service dog helps a college senior cope with her POTS (Postural Orthostatic Tachycardia Syndrome), a rare autonomic nervous system dysfunction that restricts blood flow to the brain. This college student also just so happens to be the niece of our very own Dr. Lawrence Laveman! Four legs, floppy ears, and a wet nose don’t seem to fit the typical description of someone equipped to help with disabilities, but in the case of Shayna this description is just enough when paired with years of training. 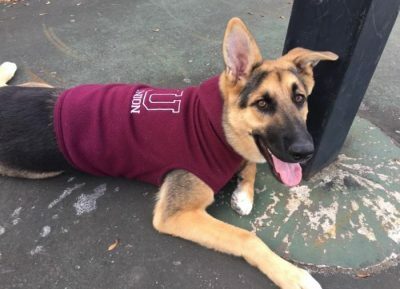 Shayna, an almost 9-month-old German shepherd, is in training with Sara Covelli a senior environmental policy major, to eventually work as her full time service dog. When Covelli came to Union in the fall 2013, she never thought she would need the assistance of a service dog to complete her time at college. She was an active student on campus, taking classes, and involved club leadership roles in U-Sustain, Chabad and the campus tour guides. She was also awarded Union’s Green Fee and Presidential Green Grant. But in the fall of 2015, things changed. She started experiencing frequent fainting spells, which forced her to leave Union. Eventually after a summer of medical tests, Covelli was diagnosed with conditions known as Sjogrens Syndrome, and Postural Orthostatic Tachycardia Syndrome, commonly known as POTS. POTS is a chronic condition due to a rare autonomic nervous system dysfunction. The ANS is responsible for bodily procedures such as blood flow, breathing and heart rate. The condition causes a spike in heart rate and low blood pressure, making it difficult for blood flow to reach a person’s brain. This leads to frequent fainting, light-headedness, brain fog, chronic pain and weakness. That’s where Shayna comes in. Shayna, who will become one of the first registered service animals on campus, helps retrieve items such as medications and water, notify her when her heart rate gets too high, and can also assist her after a fainting spell by elevating her feet to help her regain consciousness quickly. “These animals help students with a serious medical diagnosis to be able to come to our campus and learn in our classrooms,” said Shelly Shinebarger, director of Disability Services. Though there is no national certification for service dogs, Sara hopes to have Shayna certified as a Canine Good Citizen, the gold standard for dog behavior. “Service dogs should be viewed like a wheelchair, a medical device that allows me to live and function in my daily life,” said Covelli. Covelli said she’s relieved to have a partner like Shayna on campus, and wants to start a dialogue on campus to help others who are dealing with these kinds of obstacles. “I’d like Union to be as informed as possible about invisible disabilities,” she said. After graduation, she plans to attend law school, focusing on environmental law. You can follow Shayna’s journey on Instagram here.